Kyle Busch has been called many things during his NASCAR career: Self-Confident; Aggressive; Rowdy. NASCAR Nation has recently added a new descriptive title to the mix when it comes to his prowess at Bristol Motor Speedway: Dominator. When he walks onto the BMS stage next Saturday night during pre-race ceremonies and announces to the packed stadium, "This is My House," there is a lot of statistical data to support that claim. With 21 BMS checkered flags to his credit across NASCAR's top three series, he's captured the most trophies and Gladiator Swords at The World's Fastest-Half Mile by a long shot. Legendary Darrell Waltrip is second on that win list with 13 career BMS victories. At next weekend's 500-lap Bass Pro Shops NRA Night Race he'll try to make it three straight Cup victories at the controls of his No. 18 Joe Gibbs Racing Toyota. He has seven Cup wins at BMS, including three at the Night Race. On Friday, he'll try to score a track record 10th Xfinity Series victory, where also he comes in as the defending winner. In fact, last year for the second time in his career he swept all three major races during the sultry August weekend. 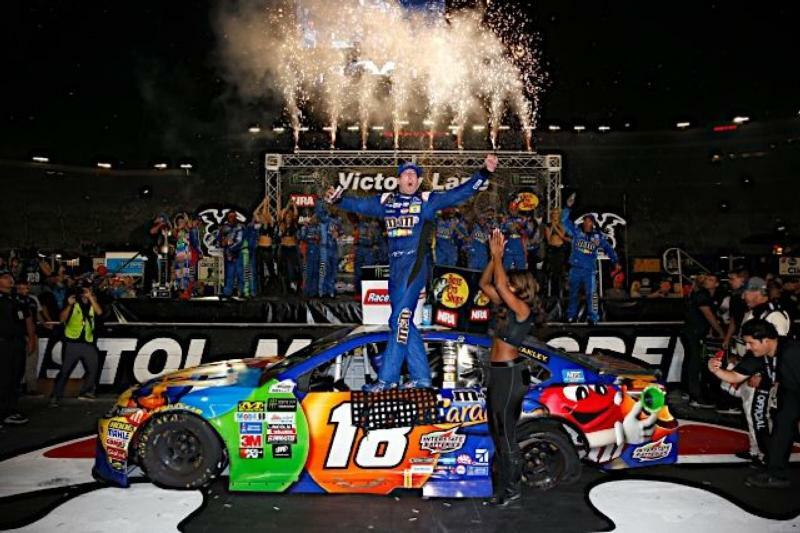 It was a feat that only he had ever achieved in NASCAR history - winning the Cup, Xfinity and Truck Series events at the same track in a single weekend -- and he did it at BMS in 2010. When you factor in everything that he's done during his career at Bristol, Waltrip and other drivers say the two sweeps stand very tall above all the rest. In fact, they say, doing it once, much less twice, is simply unbelievable. 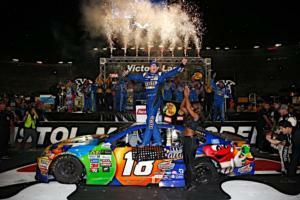 "I never in my life thought someone could win three races in a weekend there, but Kyle Busch has," Waltrip has said. "I don't know how he physically does it because all those laps in one weekend don't appear to affect him all that much. Kyle stays up on the wheel and gets the job done. Just finishing three races there in one weekend is an accomplishment, but dominating, leading the most laps and winning is the most impressive thing I've ever seen a driver do there." Kyle Larson, who has had his share of intense battles recently with Busch, ultimately finishing second, agrees with Waltrip about the two Bristol sweeps. "I've had a lot of fun racing with Kyle; I always do, especially at Bristol," Larson said. "I feel like Kyle and I have epic battles there all the time when we go there in Xfinity or Cup. It was cool for him to get the sweep there. I don't think fans appreciate how tough that is, especially as you get to the Cup Series. It's insane how hard it is to win there. I thought it was really cool." Busch just seems to find a way to get the job done. In his last two consecutive Cup wins at BMS he has won using very different styles. In August 2017, he started 18th and only led 53 laps before taking the win. He battled rising star Erik Jones down the stretch. This past April he qualified No. 1 and led 117 laps, ultimately using the patented Bristol Bump-n-Run to pass Larson to take the win. "­There are a few racetracks I go to where I would say there's nothing acceptable except winning," Busch said. "Bristol is one of my best wheelhouses, and I really enjoy (racing there). It's a lot of fun." Speaking of fun, there are four races scheduled during three nights of racing at the Bass Pro Shops NRA Night Race weekend, including action in the Whelen Modified Tour, Camping World Truck Series, Xfinity Series and the Monster Energy Cup Series. During the Cup race, you'll get to see all of your favorite drivers doing what they do best. In addition to Bristol dominator and defending winner Busch and his arch-rival Larson, you'll see rising star Ryan Blaney, 2016 Night Race winner Kevin Harvick, Daytona 500 winner Austin Dillon, defending series champ Martin Truex Jr., second-generation star and recent Watkins Glen winner Chase Elliott, Erik Jones, Brad Keselowski, Denny Hamlin and Bubba Wallace.